Janet Crump, a wonderfully nurturing, open-hearted spirit-a beautiful teacher, is the creator of Stillpoint Yoga. A certified Kripalu Yoga Teacher and Registered Yoga Teacher with the Yoga Alliance, she has practiced yoga since 1990 and has taught since 1998. Incorporating the teachings of Kripalu Yoga with Anusara and Iyengar Yoga, Janet has designed her special Yoga courses. 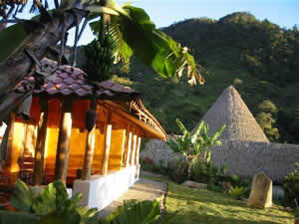 Our Finca Las Cascadas is located in Turrubarres on the winding but wonderfully pothole-free Highway 27, 17 kilometers past Santiago de Puriscal in the direction of Orotina, about an hour’s drive southwest from San José. At Stillpoint Yoga you’ll discover the basics for a solid yoga practice, including insight into the body/mind/spirit relationship and breathing techniques for relaxation. In a safe, supportive environment, youll learn how to listen to your bodys needs and respect its limitations through gentle stretching, proper alignment in the yoga postures, and a sequence of poses to practice at home. Janet currently is teaching classes at the farm, from beginners to intermediates, in both English and Spanish languages.